A Father’s love is unconditional and often gets unnoticed by everyone. He is the first hero for the children and nurtures their upbringing. He always puts the needs and desires of the children first and provides them with nothing but the best. He is the one who protects the entire family from all the obstacles and hardships of life. A Father doesn’t express his feelings much in front of the children but nevertheless loves the kids more than his own self. So, this Father’s Day, it’s time to give back to your father and express your gratitude for all the love and care he has given you all your life. We have listed down a few interesting gifts that are likely to bring a smile on your dad’s face! 1. Wrist Watch – A watch is an ultimate accessory for any man. He loves to stay updated with the time and manage the schedule accordingly. So, a new wrist watch is certainly going to be a new change for him that he will surely love. 2. T-shirts – It’s already summers and the season is in its complete swing. What better than a pair of t-shirts to complement the summer look. Find out if your father loves bright hues or the grays and choose the t-shirt accordingly. 3. Bluetooth speaker – If your father is a music fan, a portable Bluetooth speaker is an ideal gift. He can listen to his favorite songs at any place and enjoy the music. In case he doesn’t like listening music at a loud volume, you can gift him earphones instead. 4. Pen and a Diary – A stylish pen is the desire of every man and he loves to flaunt it wherever he goes. A combo of a diary and pen is likely to help him with his office work and everytime he uses it, it is surely going to remind him of you. Lovely, isn’t it? 5. Sunglasses – Summers have already begun and the UV rays of sun can damage our eyesight. So when your dad is driving, a right pair of sunglasses can protect him from the harmful UV rays. It’s nice to protect someone who has always been protecting you. 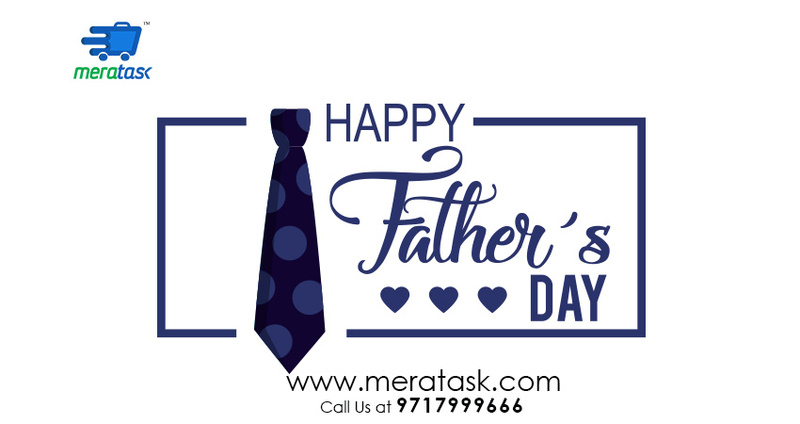 If you are living away from your father but want to express your gratitude and surprise him this Father’s Day, Meratask makes it simple for you to deliver the gifts to your father. You can book a Task on www.meratask.com and avail same day delivery services. The services are available in Delhi-NCR and you can be assured of quick, safe and secure delivery services. Thanks for sharing such a beautiful information with us. Nice Idea to send gifts to father. Plz keep sharing.